Huawei, a leading ICT solutions provider partnering with INOVI technologies today,has unveiled much anticipated series of tablets in Pakistan. This new series by Huawei is aimed to provide stunning HD experience and has excellent top-notch features, good connectivity, flexible navigation and compact designs for smart life to the next one billion users. 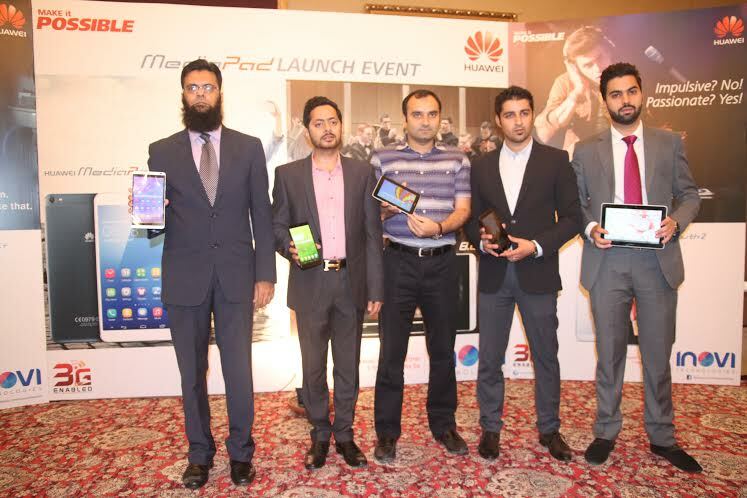 Muzammil Athar, National Sales Manager, Faraz Khan Director Marketing, Salman Javed, Manager Marketing and Syed Mashood, Project Manager Huawei technologies Pakistan and Zeeshan Mianoor (center), CEO, Inovi Technologies seen at the launch ceremony of Huawei’s Media Pad (tablet) series. The new Tablets (Media Pad) series launched in Pakistan include the Link 10+; and stunning HD experience for movie lovers. It has a bigger 10-inch HD display, powered by Quad-core 1.6 GHz processor, with lightning speed and latest technology. Huawei has designed the Media Pad Link 10+ to bring best and top edge technology to people. Huawei Media Pad M1 8.0 is another addition to its stylish series it is offering in Pakistan. With 8 inch HD display and powerful Quad-core 1.6 GHz processor, it provides extraordinary visual experience, from every angle. The pad is also equipped with front-facing dual SWS stereo speakers, redefining audio pleasure. Huawei Media Pad X1 7.0 exceeds the limits with 13mp rear and 5mp front camera. You can capture your loving moments with crystal clear perfection. The revolutionary slim 7-inch tablet has a Quad-core 1.6 GHz processor with 2GB ram. It has all the necessary components to provide easy communication and enjoying innovation at its best. All editions of the Huawei Media Pad tablet series are Wi-Fi and 3G enabled. Huawei Media Pad 7 Youth 2 is designed keeping in view the youth and passionate people. It has a metal body with 7 inch HD display, loaded with WSVGA experience.